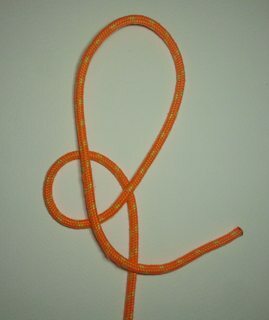 It's super-easy to tie and really handy, an extra half hitch for security is possible. The Basko loop (Basque country-Bashkortostan Rep). similar structures that look good, or even better, too. Thank you for your kind reply Dan. 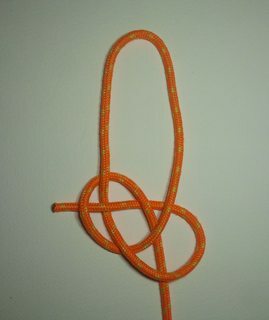 I'd like to bring this knot for investigation. the eye is shown (in a loose form) by Graumont&Hensel in their Encyclopedia as the Half-Open Carrick Loop (plate 33, #150). I think the nipping loop performs better if you start with a left-handed loop! Thanks for bringing your find. I had played with versions of the Carrick structure some time back and found that I preferred to make a full coil at the nipping area as in the attached photos. I favor a bowline with a security lock for my personal uses instead. 3 diameters for that to surround & compress). how many could one possibly need? of the Wot?knot. But mostly they're just BS, nonsense. --a possibility, at least, when dressing & setting. Which is to concur in SS369's leaning to a surer thing. Thank you very much for this investigation! 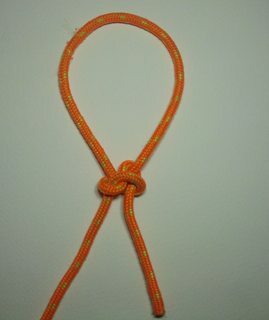 IMO this knot has the advantage that is very easy to tie and remember (only 3 basic steps), it's adjustable and I suppose it doesn't jam the rope. About the utilities I'm no quite sure yet, there may be several. as the Half-Open Carrick Loop (plate 33, #150). at plate 38 #218 (IIRC), with a different, invented name. 2) how to dress the knot. ...no Dan, it is different: in #150 (as in the knot by Ramos) the 2 initial loops/turns are of the same handedness/chirality whilst in #218 the loops/turns are of different handedness (as the knot I proposed thinking that the nipping loop performs better): but I don't see any Weaver's Knot (whilst they saw it!?). yes I agree with you: it's a strange book, but I use it as a book of exercises : I tie a knot and then I try to evaluate it! By the way, Cyrus Day in the bibliography of his "The art of knotting & splicing" about Graumont&Hensel's Encyclopedia says:"(Much of the historical introduction is derived, with verbal alterations, from Day, Sailor's Knots, 1935.)". p.s. with this post I become a Sr Member! the #150 is the mirror image of yours. Hello Knotsaver, many thanks for the pictures. Yes, it's the same knot indeed, tied on the right (mirror). And so...in its unloaded 'carrick like' dressing state, it is vulnerable to transformation. When load is applied, the returning eye leg triggers transformation into its final stable state. 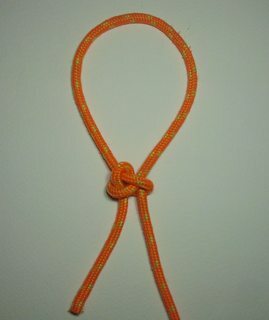 As an 'eye knot' - I see no advantages over other eye knots such as Scotts locked Bowline. I also dont see a nipping loop in the final stable dressing state (it has collapsed). In terms of its 'utility' - I see nothing noteworthy here (sorry). 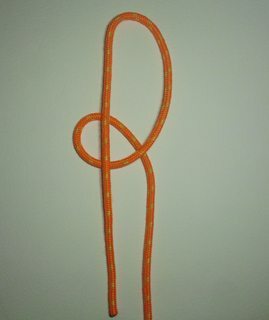 Scotts locked Bowline is increasing finding utility as an eye knot in my rope work - and I have introduced many people to it. It is ingeniously simple and effective. Off-topic, I like Scotts examples that he had posted in this thread - I would like to investigate them further. transform it from Carrick loop #1033. When loading this loop, the standing part will pull and rotate the tail try to tightening the nub. 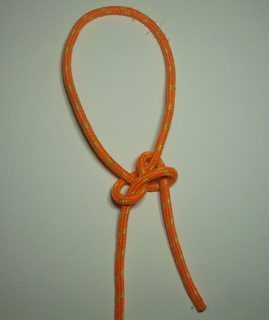 "SELF TIGHTENING EFFECT"
make the knot more compact. 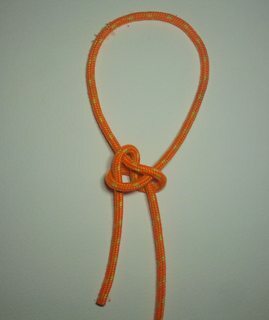 Even though this knot is no so well balance, it will not jam, can handle extreme load and super-easy to untie. For general purpose I prefer Reroute Eskimo bowline. 謝謝 alan lee.